Ohio Supreme Court Chief Justice Maureen O’Connor addresses the Gallia justice community. 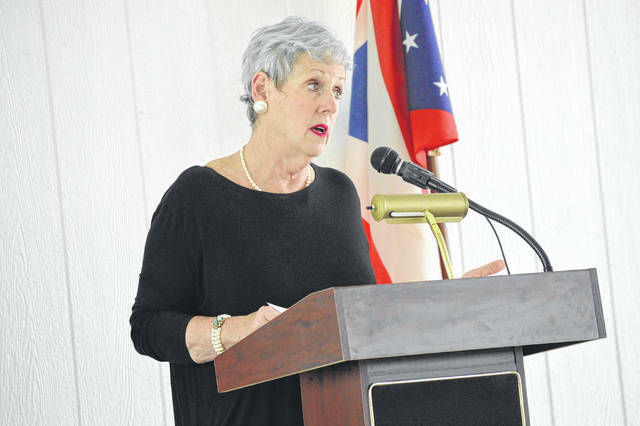 GALLIPOLIS — Ohio Supreme Court Chief Justice Maureen O’Connor joined the Gallia County law enforcement and justice community Wednesday afternoon to present Gallia courts with grant dollars equaling more than $83,000 during a presentation outside the French Art Colony. Applications are screened and narrowed down to be selected. Gallia County did a “fabulous job” with their applications, according to O’Connor. “The (Ohio Supreme Court) established the technology initiative to facilitate the exchange of information and the warehousing of data by Ohio courts and other justice systems through the Ohio Courts Network to deliver technology goods and service to the courts to…aid in the orderly adoption and comprehensive use of technology in Ohio,” said O’Connor. The Ohio Supreme Court, this year, has awarded $2.9 million in technology grants across the state and have awarded around $10 million in grants since the program started. The money in Gallia County will pay for e-document management systems and other court software. O’Connor said these dollars did not come from additional appropriations but were part of money the supreme court received from Ohio’s general revenue funds and the budget the court submits every two years. She said she has not earmarked them for the supreme court and felt they were better used to help close technology gaps with local court system funding. The Gallia Court of Common Pleas received $31,396.68. The Gallia Juvenile and Probate Court received $47,171 and the Gallipolis Municipal Court received $4,970.50. The Gallia Clerk of Courts Office previously received such a grant in 2015 totaling around $38,500 to put towards technology improvements. Such technology can allow for better scheduling systems with the court as well as prevent court staff from having to copy paper materials or continually resubmit hard copy documents for records and communication with law enforcement, administration and more. https://www.mydailytribune.com/wp-content/uploads/sites/42/2018/05/web1_DSC_0324.jpgOhio Supreme Court Chief Justice Maureen O’Connor addresses the Gallia justice community.